Rob misses quite a bit of Dutch food from time to time, so we like to recreate some of the typical dutch food that you can’t get here in Ireland. Sometimes the ingredients can be quite hard or impossible to get and other times it’s just about substituting it for something else to get a similar result. 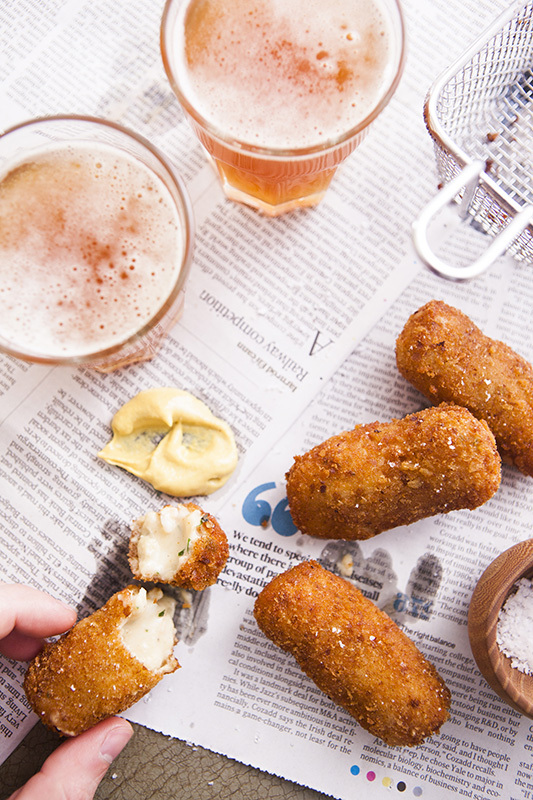 Kroketten and Bitterballen are one of our favourite snacks to have with some beer. They are similar to what many English and Irish would have as croquettes except they are not filled with potato but with a filling similar to stew? Encrusted with golden breadcrumbs they are just EPIC when paired with some Gouda and a great beer…or any beer really. We are heading over to the Netherlands next week for a holiday, we both really need it because work has been so intense and busy lately which is fantastic but having to perform creatively constantly can wear away at you. So, I’m really looking forward to having a little trip to spend time with Robs family and our old friends again and of course lots and lots of prop shopping while I’m there!! I used the recipe from De Banketbakker by Cees Holtkamp who is a master in all this Dutch and baking. Recipe makes about 15 Kroketten. Now, first things first. The prawns need to be deshelled, this is probably one of the more annoying parts but it’s essential to make a good fish stock. You should be left with approx 300g of shrimp meat. To make the stock, fry the shallot in some butter and stir in the remaining shrimp shells with 300ml of water, bring this to a steady boil for about 10mins. Remove the pot from the heat and leave to cool slightly. Your aim is to have solely liquid so sieve stock and discard the shells and anything caught in the sieve, you should be left with about 250g of stock liquid, put to the side and let this fully cool. To make the roux melt the 80g of butter in a saucepan, when it begins to foam, stir in your flour and cook for 1/2 mins until its golden in colour. Slowly add in your stock and milk, stirring and adding the liquid bit by bit, stirring continuously, Let this cook until its shiney and the flavour of flour is cooked off. Now you can add in your geletine leaves to thicken the whole mixture up. In a small bowl, whisk lightly your cream and egg yolks, then add this to your roux. Remember to keep stirring, you will feel the texture change and becoming thicker. Season it with salt, pepper, tobasco, and cayenne pepper this would be a good time to give it a taste to see if you need any extra seasoning. Now you are ready to add in the shrimp (if you are using larger shrimp make sure to chop them up first so you only have small pieces) finish by adding in the chopped parsley. Cover with cling-film and leave over night in the fridge. After the chilling process, scoop out little balls of ragout (approx 60g) roll these into the fine breadcrumbs to form small logs. Beat the egg whites and stir in the flour in a separate bowl, dip the logs into this egg white mixture and then drop into the large breadcrumbs and set aside, repeat this with all of the ragout, form a mini production line. To cook the kroketten, Heat your pan filled with sunflower oil or deep fat fryer until it reaches 180C and fry the kroketten in small batches for 3 minutes. If you don’t want to cook them all up, they can also be frozen for up to 2 months.